Foo-Foo Tei - Hacienda Heights, CA (2): The food itself deserves this #1 ranking. Add in a cool and friendly staff with a crazy, imaginative, culinary genious at the helm and you get an unbelievable combination that defines how a ramen-ya can thrive in the U.S. With 31 different types of ramen, several appetizers & entrees, and THE BEST Japanese curry in quite possibly the world, Foo-Foo Tei is without a doubt my favorite! Asa Ramen - Gardena, CA (3): Inconsistent or not, you won't find a better kotteri shoyu on this side of the Pacific. It's as close as you can get to Tokyo while remaining in LA. Shin Mama Ramen - Torrance, CA (4): Because my mama STILL says so! And because I say...SHINASOBA! Umemura - Gardena, CA (1): Last year's #1 may have dropped a few spots, but it's still going strong with an unbelievably soulful Umani Ramen. Daikokuya - Los Angeles, CA (5): Do I need to explain this one? Rock solid, it remains at #5. Shin-Sen-Gumi - Gardena, CA (n/a): Kaedama please! No not the noodles, I'm talking about the girl in the YouTube video...hahaha. This Gardena location is the best of the 3. Gomen - Stanton, CA (37): Most improved! And best in OC! A rather bland gomoku ramen kept them out of the top 5, but their tonkotsu-shio more than makes up for it. Shisen Ramen - Torrance, CA (8): Shisen Ramen then a beer...no complaints here. Chabuya - Torrance, CA (n/a): Better than the original (LA that is), it makes me feel all "kara kara" inside. Santouka - Los Angeles, CA (n/a): What? Top 10? The West LA location left quite an impression. Ramenya - Los Angeles, CA (6): No longer the best of the west-side, but runner-up ain't that bad either. Kohryu - Costa Mesa, CA (11): It's definitely improved, but so have others. The love-hate meter with Kohryu is currently leaning towards love. Let's see how long that will last. Shin-Sen-Gumi - Fountain Valley, CA (9)*: Top 15 for sure. Ebisu Ramen - Fountain Valley, CA (14): Aaah, Ebisu. Takeda-san, I have a new hero and sometimes they call him Doraemon. Tamaya - Hacienda Heights, CA (16): Tamani (sometimes), it surpresses the need for nearby Foo-Foo. Gardena Ramen - Torrance, CA (7): Shhh...it's a secret. Chabuya - Los Angeles, CA (13)*: Still love the environment. Tajima - San Diego, CA (n/a): Best in SD! Don't worry, it could be worse. Santouka - Costa Mesa, CA (15): Yeah, that's probably more like it. Ducks - San Gabriel, CA (n/a): If you listen closely, you might hear a QUACK. San Sui Tei - Los Angeles, CA (n/a): A decent alternative to Daikokuya, but why do you feel the need to have sushi?! Togoshi Ramen - Las Vegas, NV (n/a): Dude, a ramen-ya in Vegas? Awesome! Mentatsu - Costa Mesa, CA (39): Yes, you're not the worst in OC. Congratulations. Koraku - Sherman Oaks, CA (17): The best ramen near my work. Mabo is my favorite. Koraku - Torrance, CA (n/a): I still have the right to remain silent. You can talk to my lawyer. Men-Bei - Torrance, CA (12): Don't get it without MSG. It's a necessary ingredient here. Kiraku - Gardena, CA (20): Much better than that sorry place next door. Santouka - Torrance, CA (n/a): Perhaps the competition is intimidating. I wasn't very impressed. Hanaichimonme - Los Angeles, CA (26): Superballs, transformers, and ultraman. All great memories from my past. Kinchans - Los Angeles, CA (18)*: It's not that bad, actually. Asahi Ramen - Los Angeles, CA (19)*: It is that bad, actually. Orochon Ramen - Los Angeles, CA (32): The challenge still awaits me. Or should I say eludes me. Tamaya - Alhambra, CA (n/a): Freshly opened this year, SGV needs a place like this. Ramen Nippon - Reseda, CA (21): C'mon, just call yourself Ramen Valley. Daikokuya - Costa Mesa, CA (n/a): It's sad, but it's still maturing. Get rid of the diapers already! Kokekokko - Hacienda Heights, CA (22)*: Still hits the soul. Koraku - Los Angeles, CA (24)*: Still around and still fading. Teri Café - Oceanside, CA (25)*: I'll need to revisit in 2009. Santouka - San Diego, CA (n/a): Hey, at least you got a Santouka! Maruyu - Santa Ana, CA (n/a): What a disappointment. My last visit felt like I was slurping transmission fluid. Hanashima - Rowland Heights, CA (28): I'm confused, an island on a flower? Shin-Sen-Gumi - Rosemead, CA (33)*: At least you're not called Shin-Sen-Gomi. Joy Mart - Los Angeles, CA (n/a): Why do I feel so happy? Café Koraku - Jean, NV (n/a): Dude, a ramen-ya on my way to/from Vegas? Awesome! Oki Doki - Costa Mesa, CA (41): Okee Dokee. Mr. Ramen - Los Angeles, CA (34)*: Hi mister, let's meet again in 2009. Honda-ya - Los Angeles, CA (35)*: Izakaya, beer, yakitori...no ramen. Sushi To Sakedokoro - Anaheim, CA (n/a): Only this low because their ramen has not yet been perfected. It could be next year's most improved. San Sui Tei - Temple City, CA (36)*: Still yearning for more. Tokyo Table - Arcadia, CA (n/a): Not a place for ramen. Gyu-Kaku - Pasadena, CA (n/a): Not a place for ramen, either. Chopstix - San Diego, CA (n/a): I don't know what to say. Nothing memorable here. Rockstar Noodle Bar - Rowland Heights, CA (n/a): Stick to the teas and appetizers. Rockstar's don't really eat ramen, anyway. Mitsuru Café - Los Angeles, CA (38)*: Reminds me of my grandma. Eboshi Noodle Bar - Lomita, CA (30): Do I smell ammonia? Kyushu Ramen - Van Nuys, CA (27): Down, down, down. Hachoo. Bless you! Katana Sushi - Hacienda Heights, CA (23): A once great tamayu ramen has now been bastardized by multiple ownership changes. Aji Man - San Gabriel, CA (n/a): Now accepting applications for umami. Hamada Orient Express - Los Angeles, CA (n/a): The finest airport ramen in the U.S.
Igosi Ramen - Rowland Heights, CA (40)*: It's actually not ramen, but ramyun. Takaraya - Irvine, CA (42)*: Hey, at least they were open on Christmas. Yokohama Kaigenro - Los Angeles, CA (43)*: I would still hate to see them be evicted. Tampopo - Gardena, CA (n/a): This is that sorry place next door. Fuji Ramen - San Gabriel, CA (n/a): Even though the ramen I tried at Mt. Fuji wasn't much better, at least that ramen was from Japan. Ajisen Ramen - Temple City, CA (44)*: Still not for me, regardless of location. EZO Noodle Café - Irvine, CA (45)*: E-Z-O, E-Z-O, E-Z-O. It's only fun to chant its name. Noodle World - Pasadena, CA (46)*: Don't even bother. UCC Café Plaza - Walnut, CA (n/a): The biggest disappointment of the year! Stick to the coffee. Sakura - Los Angeles, CA (n/a): Needs to be replaced with Santouka, badly. Sushi Pia - Fullerton, CA (47)*: Su-su-su-sushi pia. Mountain - Rowland Heights, CA (48)*: For as long as Mountain stays open and serves their gnat-infested ramen, they will continue to pad the bottom of this list. Wow, I didn't realize the list was so long. Anyway, I hope you had as much fun as I did in 2008! Hopefully, I'll be able to complete the SF ramen-ya's in 2009, as well as check out some more cities across the U.S. and Japan. Be safe and have a very, very Happy New Year! Don't forget to eat your toshi koshi soba!! I first met Tajima-san (the original owner) shortly before he closed the Rowland Heights Tampopo earlier this year. As we talked, he acknowledged the public's familiarity with Tampopo, the movie, and confessed his desire to build a franchise of Tampopo restaurants along the West Coast. After first opening this Gardena location, he went on to open three more in Costa Mesa, Irvine, and the aforementioned Rowland Heights. Sadly, those three are now closed and this last remaining Tampopo is owned and operated by somebody else. What I'm about to say next might irk Tajima-san (and others), but I hope he gets to read this so he understands the reality of what's going on. The Gardena Tampopo is not at all living up to the aging movie. In fact, it may be tarnishing the name instead. Soon enough, Tampopo Ramen will no longer be associated with a wonderful movie, but with a bad taste in one's mouth. I hate to say it, but that's the truth. Tajima-san, please come back and open YOUR Tampopo before it becomes too late...onegai!! Tampopo Ramen: Supposedly a tonkotsu base, this Tampopo Ramen tasted only like pepper. Honestly, I couldn't taste much else. It wasn't creamy, it wasn't rich, and it definitely wasn't very good. The menma was from a can (I think I have some in my cupboard) and the chashu was borderline nasty. I swear, the scab on my knee probably tastes better. Make sure you call first to check the times because some won't be open all day. If you know of any others, feel free to post a comment or email me. Merry Christmas and Happy Holidays! Stay warm and slurp loud!! A friend once told me that Gyu-Kaku's ramen is really good! Specifically, they said Gyu-Kaku's ramen in Pasadena is really good! And this was the same friend that said Tokyo Table's ramen is really good. Can you see where this is going? Yup, I'm definitely gonna have to reconsider this friendship over the holidays...hehe. Goma Negi Ramen: The menu describes it as: "Ramen served in a special SHIO broth topped with ample Green Onions & Sesame Seeds." I will describe it as: "Sapporo Ichiban noodles overcooked in a stone pot and served in a special instant-like soup with a touch of Green Onions & Sesame Seeds." I'm sorry, but I could've made this at home. The only positive thing about this ramen was the chashu, but that still wasn't even great. There's also a raw egg dropped in that gets cooked in the soup. You know, just like when you make instant ramen at home. Thank goodness this is a Japanese BBQ restaurant and not a ramen-ya! My favorite is the Harami Miso! So next time you're stuck in Pasadena and desperately craving ramen, just chew a stick of gum until that craving dissipates. But if you must eat the ramen here, please do so at your own risk. Otherwise just stick to the meat and beer! If someone were to tell me a Japanese restaurant in San Gabriel named Ducks serves good ramen, I would have laughed and said "You're Crazy!!" Wait a minute...that actually happened! I can't believe I've driven by this place thousands of times on my way home from work and never realized that (1) they had ramen and (2) it's Japanese. Apparently known more for their curry & spaghetti, Ducks also has a few ramen on the menu. Simply labeled Chashu Ramen, choices of soup base include Shoyu, Miso, Tonkotsu, Curry, and Tonkotsu Curry. But don't worry, no actual ducks were hurt in the boiling process. Chashu Ramen (Shoyu Base): Beautiful! Definitely well presented, but we all know true beauty comes from within. So after a poignant first impression, it was time to sip its soul...absorbing, exotic, captivating, humurous, fashionable. Oh wait...I'm describing the girl that was sitting across from me...hehe. Sorry folks, now let me get back to the ramen. Wonderfully presented, this ramen was light and refreshing with a decent non-overwhelming flavor. Slightly above average, simple enough to soothe a craving would aptly describe this shoyu ramen. Topped with chashu, bok choy, and a few strips of negi, I felt like it could have used something more. The chashu was somewhat disappointing as well, but like I said...it's simple enough to soothe a craving. Although most likely not homemade, the noodles tasted very fresh and cooperated with the soup. Evidently, my slurping got a 10 on the noise meter...haha. Cold Ramen: Basically a hiyashi chuuka without most of the ingredients that make it a hiyashi chuuka. Did that make sense? In other words, it's the same sauce without all the vegetables and ham and stuff. It was good and I liked it, but I'd rather have some soup. Mini Curry: The curry was delicious! Impressive, but I still wouldn't call it the best. Hmm...it makes me wonder how the Tonkotsu Curry Ramen tastes. Ducks has been around for a long time. Something like 10 years if I'm not mistaken. Which makes it all the more shocking that I never knew it was here. This can only mean one thing...that there must be others like Ducks hiding in a neighborhood near you! If you have a recommendation, please please let me know! 2015 W. Redondo Beach Blvd. The original Hakata Ramen Shin-Sen-Gumi location in Gardena has been around for more than a decade and is still considered the best (imho) compared to its Fountain Valley and Rosemead siblings. (I just can't believe I haven't posted this location yet!) So where should I start? All Shin-Sen-Gumi restaurants have a lot of character and it probably would be unjust if I tried to explain their mission in my own words, so here's a little video in "their" own words. Hakata Ramen: As stated in the video, you can modify this ramen to your liking by specifying the texture of the noodle, the amount of oil used, and the amount of flavor added. It's like having your own personal ramen chef! Unfortunately, you can't take them home. Anyway, like I said before, the Gardena location is my favorite out of the three. There's definitely a harmonious feeling of originality that transfers over to the soup. I've never been to Hakata (or just too young to remember), but this is probably as close as one can get in Los Angeles. Its creaminess rivals that other place and on some days may even be better. The toppings (chashu, shoga, negi) are great too. Kaedama Onegaishimasu! Gyoza: Top 5 for sure!! I got mine with the A-set. Highly recommended! Feel like ramen on New Year's Eve? This location will be open until 5AM New Year's Day for all post party celebrations. So get yo drunk-a** down there! That makes me wonder...does ramen qualify for toshi koshi soba? Exit Weir Cyn off the 91 freeway. Sushi To Sakedokoro translates to a place for sushi and drinks. So what is a sushi-ya doing on a ramen blog, you ask? Well let me give you a little background first. This restaurant was originally opened by a family friend of ours a few years back and it used to be my dad's favorite hangout. My stepmom even worked there for a short period of time up until it was sold to a nice Korean family last year. So fast forwarding to today, the new owner's son (Chef Jun, who's also the head sushi chef) is a HUGE fan of Japanese ramen. And for the past five years, crafting a unique bowl of his own has been his passionate hobby. He remembers working in San Diego several years ago, stumbling upon a newly opened Tajima and trying an eye-opening ramen for the first time. The ramen had tickled his soul and he was forever hooked. Ahhh, I know the feeling. Just from hearing Chef Jun speak about his recent trip to Japan and how he ate ramen everyday tells me that his passion is for real! Kimchee Ramen: Described as his specialty, Chef Jun meticulously began cooking at the small stove behind the sushi bar. His knowledge of ramen is purely based on curiosity. He's had no training and relies heavily on Japanese books and TV shows that explain the improvised art. Throw in some Korean flair and you get the Chef Jun special--homemade kimchi sauteed with ground pork topped on a shoyu-based ramen that also includes egg, baby corn, negi, and sesame seeds. Although still in its infancy, you can taste the potential that his passion will bring. It wasn't spectacular, but I know that in due time it will be. Pretty soon his dad will need to rename the restaurant to Sushi To Sake To Mendokoro! Doesn't this close-up look at the sauteed kimchi make your mouth water? Mmmm...right? Since Chef Jun is constantly experimenting, everyday might produce a different style ramen. He has no boundaries and no limits. He opens the gate and just lets his creative juices flow. The noodles are store bought and nothing special, but Chef Jun does envision making his own someday. Perhaps his own full-fledged ramen-ya is in the works? Oh yeah, and they also have sushi. On nights that are really busy and since ramen isn't "officially" on the menu yet, Chef Jun may not have the time to make it, so you may want to ask first before you sit down. He's looking into buying a bigger stove and hiring some more staff but until then your best bet is to go during off-peak hours. And now if you're stuck in the Anaheim Hills/Yorba Linda area, there's no need to travel far for ramen anymore. It's a good location and definitely fills a void in that region. Let's be patient and hope that Chef Jun can master the art of making ramen! It's about time I turned that radiused corner heading due south on Interstate 5, in search of the best ramen that San Diego has to offer. I couldn't have picked a better day to drive down the coast either. With clear blue skies, 72 degree weather, and an abundance of sunshine, it was a beautiful December day for slurping in San Diego. My first stop was the much anticipated Tajima Noodle House. Arguably, the best ramen SD has to offer (according to most locals), I've been anxiously waiting for over a year now to experience that revelation on my own. Upon reviewing the menu, Tajima offers four choices for soup base (shoyu, shio, miso, and tonkotsu a.k.a. "Tajima Original") and two choices of noodles (thin-cut vs. thick-cut). There's also plenty of rice bowls and entrees along with udon and soba, in case ramen isn't part of your diet. Obviously, I completely ignored those other sections. Shoyu Ramen (w/thin-cut noodles): The instant my tongue touched the soup, I could taste a strong niboshi flavor that harmonized well with a deep, yet crisp, shoyu taste. Not quite kotteri and not exactly assari, but interesting nonetheless. The toppings (chashu, hanjuku ajitama, nori, negi) were simple and barely worth mentioning. The chashu was very tough and very disappointing. The egg, on the other hand, was delicious. The thin-cut noodles tasted fresh, were perfectly cooked, and paired well with this broth. No complaints there. Tonkotsu Ramen (w/thick-cut noodles): As I mentioned above, this is also known as the "Tajima Original". I was hoping that "original" would translate into the best ramen that Tajima has to offer, but apparently this wasn't the case. The Tonkotsu Ramen, in my opinion, was far inferior to the Shoyu Ramen above. Light and bordering on bland, it wasn't horrible, but I was expecting so much more. Where was the creamy, smooth, jaw-dropping flavor that a good tonkotsu is known for? Evidently not here. Contrastly, the thick-cut noodles were a welcome change, but probably would have tasted better in the shoyu. Here's an up close comparison of the thin-cut vs. thick-cut. As you can see, there is a big difference. I usually love a thicker cut of noodles, but I'd have to give a slight edge to Tajima's thin-cut today. They were a lot easier to slurp! So I've decided to return to Kohryu (yet again) in hopes of the once-known-glory doing the same. If you've been following this blog, you might remember how Chinese Restaurant Koryu was historically the best ramen-ya in OC, but after a few ownership changes they just kept plummeting (imho) like the stock market is today. Ironically, "Chinese Restaurant" Koryu had better ramen than "Japanese Noodle House" Kohryu (not sure what's up with that or the added "h"). But it's been 10 months since my last visit and because I'm constantly hoping for ramen improvement wherever I revisit, I found myself back in a familiar spot, reminiscing (yet again) about the past. Shacho Ramen: Shacho means boss, so apparently this would be Boss Ramen. (Whenever I hear boss in a Japanese context, it always reminds me of Tiger Woods' Boss can coffee commercial...remember that?) In any case, I wanted to order the kotteri shoyu Koi Ramen but they were out of it on this day. So instead, I ordered the other "Chef's Favorite" in the kotteri miso base. Amazingly, this s*** was good! The toppings (ground pork, moyashi, onions, negi, chashu, menma, and caramelized scallions) were surprisingly out of this ramen world. The sweet miso-infused sharpness really tingled my tastebuds with a boss-like lashing. Within minutes, I was at bay and yearning for more. The noodles weren't very impressive, but I've pictured the average curly noodle below to give a comparison of what comes next. ...a different noodle. Yes, you read it correctly. 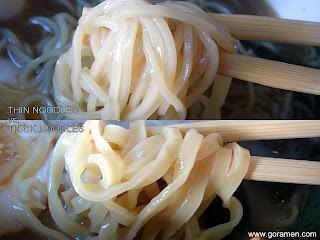 This Chanpon comes with a more straight noodle like the ones you'd typically find in Chinese noodle soups. Impressive indeed! I wouldn't have it any other way! Gyoza: Unfortunately, the gyoza showed no improvement over past visits. A mushy, overloaded mess of garlic and pork that doesn't even satisfy a starving soul. Skip these for something else! This neighborhood is very special to me and it always feels good to come back home. Although Kohryu will never be the same as I once remembered it, it's always nice to know that it's still there. There's nothing like eating ramen and then scheduling your next Japan trip right next door! After spending the last 8 days under citizen's arrest (haha...whatever), I've finally posted bail and found my way to the rameniac's hood on the westside. Yes, it's hard to believe that I've never been to the "Santa Monica" Mitsuwa before, but since you-know-who has been touting this Santouka for quite awhile, I had to at least come and see if it was better than the others. Unfortunately, the signature shio ramen was sold out by the time I got there (booo...), but I wasn't going to let that discourage the night. Kara Miso Ramen: Ka-Ra-Mi-So-La-Ti-Do~~. Okay, so I liked it. Rameniac was right. For some reason this West LA branch tastes a lot better than the others. But why? Who knows... This Kara Miso tasted great and really satisfied my constant ramen craving. Although it's not very spicy at all, I felt like it was just the right amount. The toppings (kikurage, chashu, menma, negi) were abnormally normal, but the noodles were magnificently magnificent! Tokusen Toroniku Shoyu Ramen: Since I couldn't have the Shio and ordering the Tokusen Toroniku was a must, Shoyu was the next best option. With disappointment looming in my mind (not from the Toroniku), I was prepared for a mediocre shoyu ramen at best. But first, let's talk about the specialty. If Santouka's Toroniku could talk, I have no doubt that it would sound as confident as Muhammed Ali in his prime. Guaranteed! Now to the Shoyu. Although it really can't compare to Santouka's signature Shio Ramen, today's Shoyu was incredibly better than those found further south. I can't believe I'm really saying this. Rameniac must be pumping something in the air up here! And the noodles in the Shoyu were exactly as good as the noodles in the Kara Miso. So maybe I've changed my tune about Santouka (keyword being maybe), but it will still take more to change the score. Hmm...how much more?